It would appear the the first possible instance of solid hydrogen has disappeared, if it was ever there to begin with. In a terrible accident last week in his laboratory at Harvard University, Professor Isaac Silvera reports that while testing the solid hydrogen with a laser, something terrible happened. There was an audible “pop”, and when they looked closer, they found that one the diamonds in the apparatus that was holding the metallic hydrogen had turned to dust. 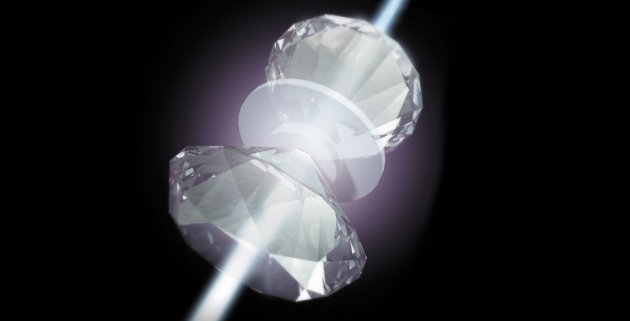 The twin diamonds were creating more pressure than exists at the the center of our earth, and apparently were not strong enough to maintain it indefinitely. To make matters worse, the sample of metallic hydrogen can’t be located. Some people are saying that it wasn’t ever made in the first place and that Professor Silvera was mistaken. Without a sample to show, doubts about his technique will only grow. The explanations for what may have happened are numerous, and everyone has a different view. What we know for sure at this point is that if this really is the real deal, Professor Silvera will be able to repeat the experiment, and create metallic hydrogen again. We will all be waiting anxiously to see what happens this time.